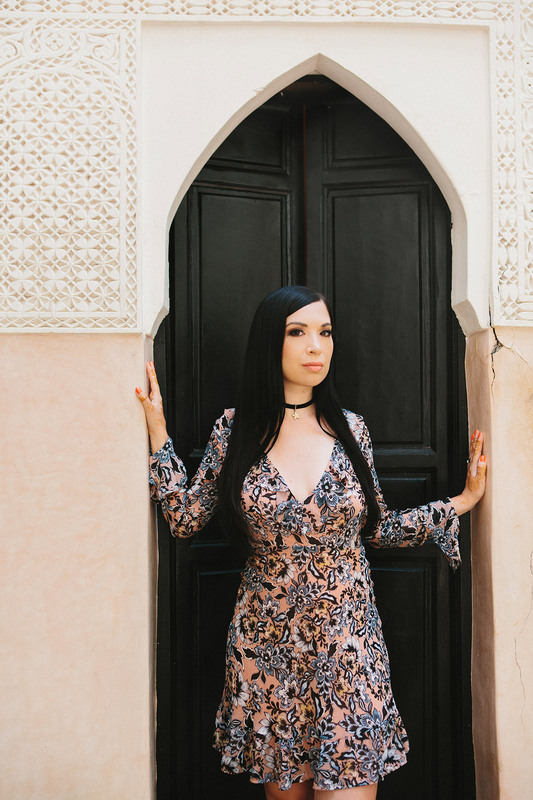 Last month, I set foot in a place full of mystique, winding pathways overflowing with treasures and 105 degree heat: Marrakech. I visited for the first time last year with Kat and Gala knowing nothing about the place — and after a whirlwind 3 days, was madly in love with the city. This time around, I packed a few things that were different from my usual all black style because dude, that heat is insane. No, I do not recommend traveling to Africa in August. Haha. Style-wise, I’ve been having a love affair with dusty desert tones and there’s a brand I can trust to always have the perfect cuts: For Love & Lemons. I got one of their dresses years ago and I remember loving its combo of style and ease, packing it along for trips from the Greek Islands to Palm Springs. Then, I picked up this rose look over the Summer and loved how it pushed me out of my usual style comfort zone. I also liked the cut and along with the winding floral pattern of the dress I’m wearing in these photos (sold out but from this collection). I think this dress is great too, which just I picked up for a trip next week. I remember the morning these photos were taken very well. 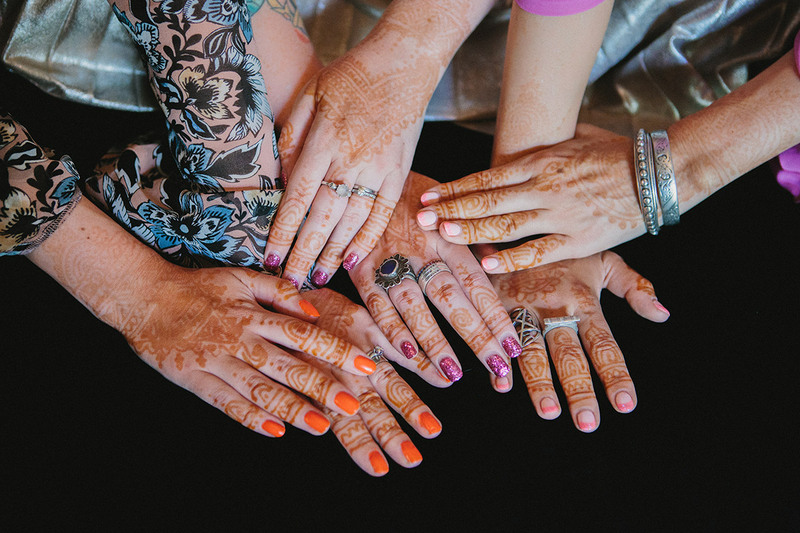 We’d been up late at a banquet dinner full of bellydancing, snake charming, henna tattooing, a live deejay and plenty of drinking the night before. I didn’t want to leave a party that epic but knew photos were happening bright and early the next day so I cut out early. Bah humbug! 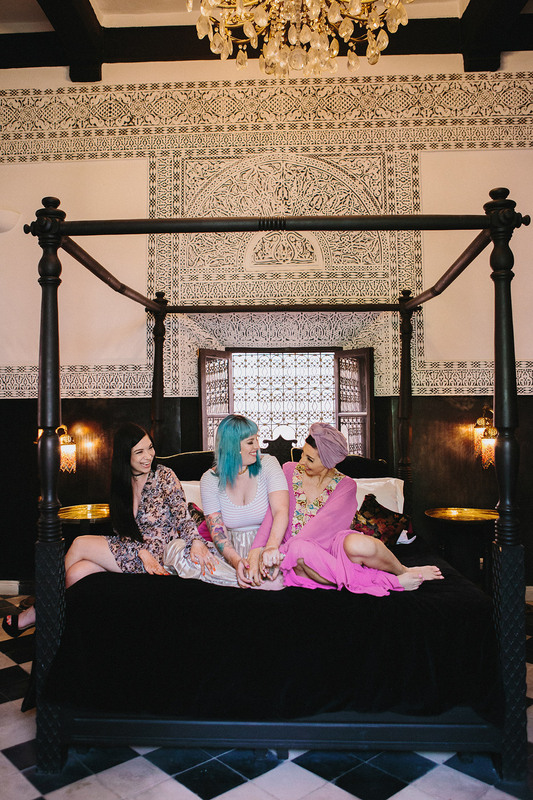 After the sun rose and we finished breakfast on the rooftop, we walked around Dar Jaguar, a beautiful riad in the heart of the souk, posing in the most ornate nooks. There’s nothing I love more than experiencing far away places with best friends. More on Marrakech next week – I have so much more to share and show you! I wore: Dress, Gracie by For Love and Lemons. Heels, Joline by Steve Madden. Photos: Shell De Mar Photography.